Last month we were contacted by Contractor in South Miami that specializes in commercial terrazzo flooring. They were looking to for a tough, high gloss, clear sealer that could seal both epoxy and cement based terrazzo flooring. Their previous supplier went out of business last year and their “go to” product was no longer available. Also were toald that before finding CoverTec, the Contractor had tried a number of products from local Big Box DIY outlets. However these products were not high quality and did not hold up. According to the Contractor these sealers didn’t even survive the hand over period! 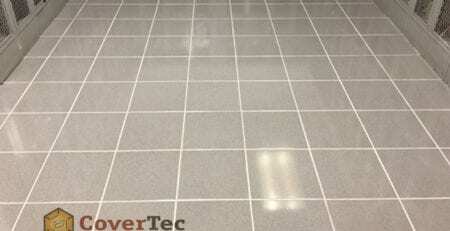 CoverTec has being supplying sealer for Terrazzo flooring for a number of years so we had a few options to offer. We were please about the opportunity to pick up an a major new customer. We were sent floor samples which we coated with both 1 and 2 part products. 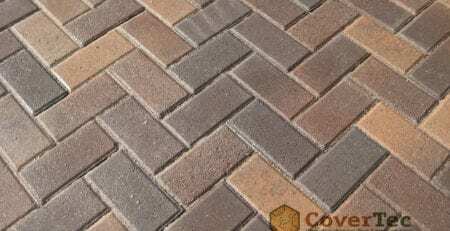 The 2 part sealer provided the best wear risitance but not the high shine without polishing. After adheshion and water testing it was agreed that our CoverShield V1 best fit the above criteria, including the best high gloss shine. CoverShield VS1 is a copolymer product ,meaning a blend of urethane and acrylic polymer. We do this becuse it produces a highly durable wetlook sealer and you get many of the advantages of pure urethane sealer at a much better cost. Bascally more bang for your buck! The first project the Contractor chose to use our product on was a new construction job. They had just installed 200 sq.ft of terrazzo flooring and the new police station in Miramar Florrida. The area was approximately 2000 sq.ft and the surface was ground to a 400 grit resin finish. The floor was washed rinsed and all residue removed by wet vac. 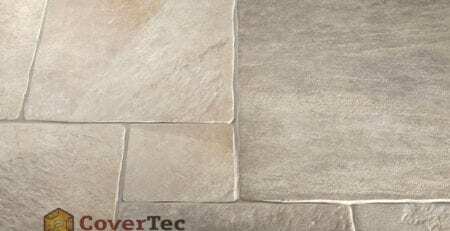 CoverShield VS1 was applied by flat Microfiber mop. A total 4 coats were applied average 1400 sq.ft per gallon. Each coat took about 20 to 30 minutes to dry before it could be waled on. The sealer application produce excellent results and tranformed the look of the floor . CoverTec is now the ‘”go to” supplier for yet another commercial contrator. Click Here for more infomation CoverShield VS1.